Dante Oliveira (FMF/Maxxis/RPM Racing KTM) watched the entire Pro line race away at the start of the Kenda/SRT AMA East vs. West Hare Scramble Shootout, Presented by Mojo Motorsports, his bike reluctant to start until the field was two turns away. But that turned out to be a temporary setback. 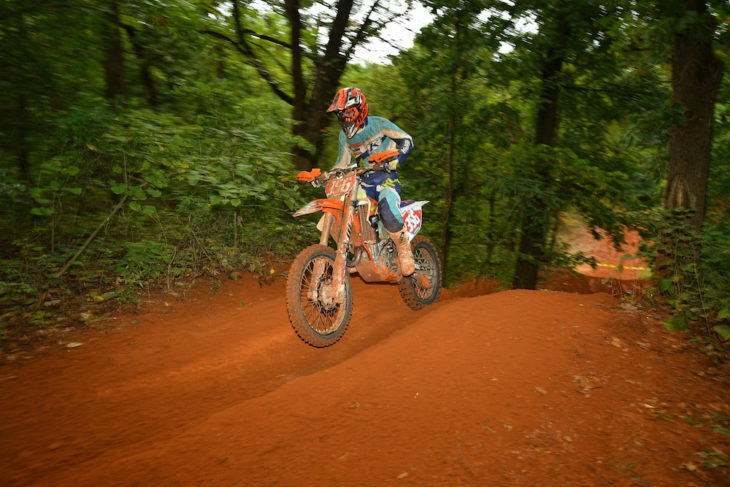 By the second time around the 13.4-mile loop, he’d sliced through the pack aboard his Motorex/Nor-Cal Motorsports/Klim-sponsored 350 XC-F and moved into the lead which he held until the finish after two hours, 47 minutes and four seconds, marking his second win of the year, at the Kenda/SRT AMA East-West Hare Scrambles Shootout in Stillwater, Oklahoma, October 6-7. Oliveira didn’t run away with it, though, as Gray Area KTM’S Devan Bolin—one of the early leaders—latched onto him and stayed threateningly close until the final lap, finishing 25 seconds behind for a West Hare Scrambles (WHS) 1-2. To prevent a last-lap attack, Oliveira preemptively upped the pace on the last lap to seal the victory—his second of the season, which moved him to second in points behind the injured and absent Trystan Hart, 152-126. Beta’s Max Gerston, the reigning series champ who was seventh overall and sixth Pro while riding with a broken finger, is third at 124 while Bolin is fourth at 115. Gas Gas-mounted Travis Coy claimed fourth place for the third straight round, putting him fifth in points with 114. Texan and OHSCS champ Zach Ingram finished fifth on his FMF/TBT Racing/Fly Racing Gas Gas, 24 seconds ahead of FMF Pro 250 winner Jeremy Wilton, the Gray Area KTM/House of Horsepower/Moose Racing 250 XC-F rider clinching the class championship with his fifth triumph of the season over rival Dillon Sheppard. Gerston, OHSCS racer Eddie Kowalski, 707 Racing Yamaha’s Sheppard and Gas Gas-mounted Kyle Kerling (the 250cc A winner and first A overall) rounded out the top 10. Just one round remains in the WHS and with the injured Hart expected to miss it, the championship fight will be tight. To successfully defend his number one plate, Gerston has to win, even if Oliveira gets second, and the points would be: Gerston with 154, Hart at 152 and Oliveira on 151. But if Oliveira wins, he’d take the championship with 156.